THE PACIFIC GROVE CHAMBER HAS RE-OPENED! On Saturday, September 28, the City of Pacific Grove and the volunteers of the Pacific Grove Hyperbaric Chamber (PGHC) celebrated the re-opening of the chamber at the official ribbon cutting ceremony. Tours were offered of the working chamber as well as the historic original chamber, and members of the staff met with the public to share information about its operation. Light refreshments were served. In addition, an open house was held on October 12 from 10am to 2pm in conjunction with the Pacific Grove Fire Department Safety Day. The chamber is located at the Pacific Grove Fire Station #4, 600 Pine Avenue, Pacific Grove, CA 93950. In early 2013, Northern California Rainbow Divers (NCRD) raised $5,585 from members and the local dive community towards the re-opening and continued operation of the PG Hyperbaric Chamber. Together with the $5,000 matching grant from an anonymous NCRD member, we sent checks totaling $10,585 to the Monterey Bay National Marine Sanctuary Foundation, earmarked for the chamber. 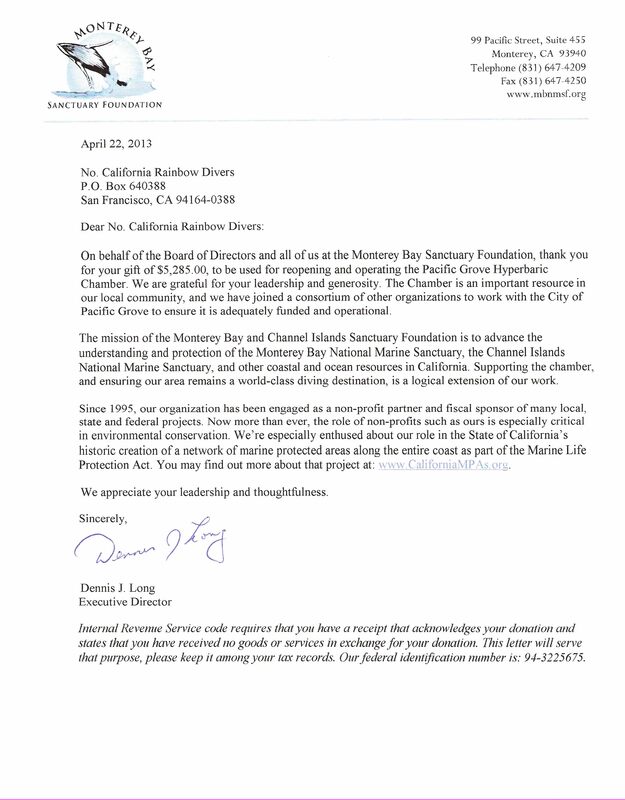 The Monterey Bay Sanctuary Foundation responded to your generous support with a resounding thanks for your leadership in helping the chamber get back online and continue to play its part in ensuring our local coast remains a world-class dive destination. You may read and/or download a copy of their thank-you letter for your records. This letter, in combination with your cancelled check, PayPal receipt or email receipt from Northern California Rainbow Divers showing the amount of your gift, will document your tax-deductible 501(c)(3) donation to the chamber for IRS purposes. If you wish to donate, you may still do so at the MBNMSF.